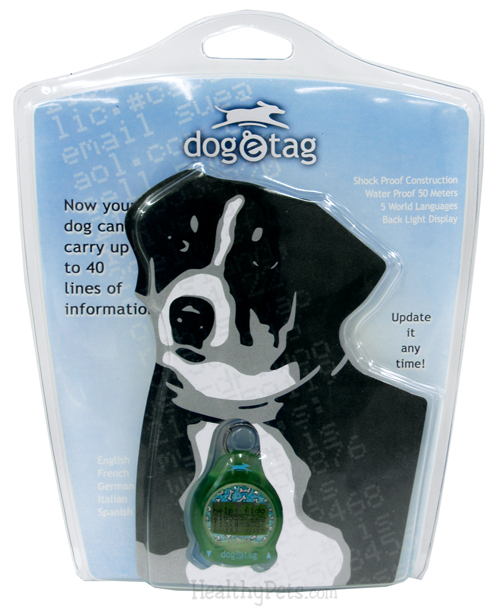 Dog-e-Tag™ is the world's first digital dog tag. It is 1 3/8 inches (36mm) around, weighs 3/4 of an ounce (21g) and is worn in a similar fashion to a common metal tag. 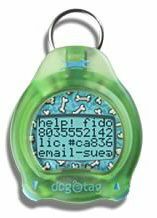 With up to 40 lines of information, one can store large quantities of data, such as cell phone numbers, pager numbers, e-mail addresses, county license numbers, rabies vaccine numbers, veterinary and neighbor contacts, etc. "I like my tummy rubbed"
"I can't hear, I'm deaf"
"I am 9 years old and I can't see very well"